Since the birth of www.englishwithelizabeth.com these past few years, I have had occasion to take a look at the websites of other people. What I have noticed, especially regarding my foreign friends and acquaintances, is a lack of quality English text abiding within their websites. It's a shame really because most of the sites I'm invited to visit are extremely professional and exquisitely formulated, but without the added touch of a flowing advanced English script. I realize what comes easily and naturally to me, does not follow suit with a lot of my friends, especially if English is not their native language. In my opinion there is nothing more disappointing and unpleasant to the reader, than poorly written English sentences, that are actually very good in concept but lacking proper English content. 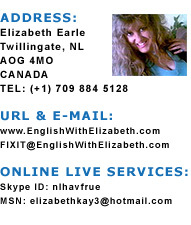 If you are struggling with an English version of your website, please register with www.englishwithelizabeth.com in order to receive immediate, professional and highly competent help. It really does make all the difference to cyber-surfers, who might haphazardly stumble upon your website, and no matter how striking they find your page to be, are put off by the ineptness of the English text. All I need in order to improve the English script you already have is your domain name, and the page or pages in question. At a glance I will be able to ferret out the English mistakes, and quickly supply the proper placement of a word, sentence or paragraph. If your website is in Danish, a language I am fluent in, you don't need to construct an English page to start, simply send me the Danish version and I will translate your site into sophisticated and high class English. To receive webpage/domain help regarding proper English usage and all of the perks good English brings with it, please register here.